Sportsman Channel has long been the leader in quality outdoor television, bringing stories of the great outdoors right to your living room. But what about the people who make it happen, those who built the American outdoor lifestyle into what it is today and built industries around the American dream? This spring, a familiar face will tell their stories and much more with a brand new program. Amazing America with Sarah Palin will travel across America in search of those who live the outdoor lifestyle with the same passion and enthusiasm as the rest of us, while shining a light on their stories. Starring former Alaska Gov. Sarah Palin and produced by Pilgrim Films & Television — the same company that produced shows like Dirty Jobs, American Chopper and The Ultimate Fighter — Amazing America will tell the stories of those around the country who embody the spirit of the American outdoors. Read the full Sportsman Channel press release. 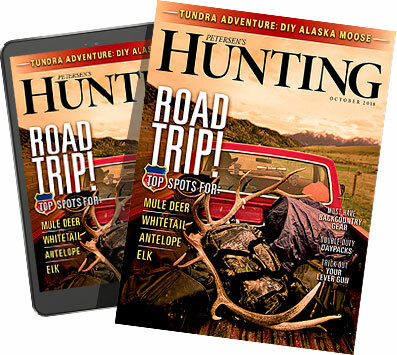 "The show really explores and experiences an anthology of stories about the most original people, places and businesses that really appeal to Red, Wild & Blue America, that great American spirit about the great outdoors," said Marc Fein, EVP of Programming and Production at Sportsman Channel. "&apos;¦ The show is really about shining a light on these folks that reflect [Palin's] passion for what makes the outdoors and our country amazing." The segments aren't just about hunting, shooting and fishing, however. "It will be a variety of different types of stories. It could be about amazing craftsmen in action in our states, about American heroes and first responders, how they train when called into action," Fein said. "We'll have some celebrities, visiting some celebrities at ranches and farms, and just some really good stories of people living the American dream in our states — who went from nothing, created a product with great ingenuity and built their dream, which is building a dream cabin." Pilgrim Films & Television President and CEO Craig Piligian — who created American Chopper and Dirty Jobs, and in 2001 won an Emmy as co-executive producer of Survivor — said while the show will include some hunting and fishing, it goes much deeper than that. "We wanted to break the mold a little bit and give Gov. Palin a wider breadth than just hunting and fishing," Piligian said. "We wanted to have a little more fun than that. So we're doing bull riding. We've got the NRA Museum. We have some fire rescue workers. It just runs the gamut of cool things in America." And if you ask Piligian, there's no better host than Palin to be your guide across America. "She is Sportsman Channel's audience," Piligian said. "They know her, they voted for her, they like her and she's &apos;¦ a guy's girl. She's that gal. She's great." Sportsman Channel CEO Gavin Harvey agreed, calling Palin "the First Lady of the Outdoors." "Sarah Palin is uniquely qualified to be an awesome spokesperson, example, role model for the lifestyle because she lives it, she does it," Harvey said. "She speaks for conservation. She lives in a place like Alaska. She lives the life. She's the real deal. She's traveled the entire United States. Sportsmen and women should be ecstatic that you've got somebody of such stature who's got such a platform to speak on behalf of sportsmen and the lifestyle that I think we're going to get a lot of people's support." And according to Piligian, Palin was herself ecstatic to place the focus on hard-working Americans rather than herself. "The reason she liked the show is that it wasn't all about her. It was about letting her be able to shine a light on everyone else that was in this world, that participated in sports, conservation, fishing, hunting, who enjoys the outdoors and everything that we're trying to be about and everything that [Sportsman Channel] is trying to be about," Piligian said. "It was about her ability to shine a light their way and not so much take the light her way. That was a key point for her." As for those at Sportsman Channel, they're thrilled to have someone of Palin's stature appearing on their network. "Gov. Palin is going to attract a lot of attention. A lot of people listen to her very carefully — millions and millions and millions of people," Harvey said. "So when she's talking about celebrating things in this lifestyle, she's a leader. She's making people feel good about this great American tradition that we are holding onto, we're fighting for and trying to pass on to the next generation. We need people like this, with this kind of megaphone, to say this is great. This is what America's all about, the great outdoors. And the American spirit and the American dream are all wrapped up together." Amazing America with Sarah Palin premieres at 8 p.m. Eastern on Thursday, April 3, on Sportsman Channel.